"Sampath Speaking" - the thoughts of an Insurer from Thiruvallikkeni: following Wimbledon ~ wealth of realtime data ! - who would benefit ?? 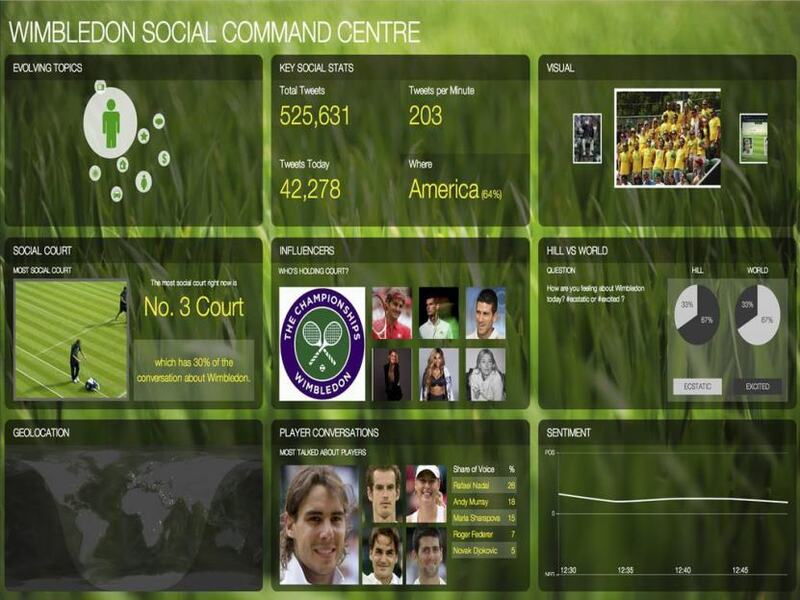 following Wimbledon ~ wealth of realtime data ! - who would benefit ?? Laura Robson says that she is looking forward to competing at Wimbledon ~ her winding journey through tennis this past 12 months has taken her to living among the Amish in Pennsylvania and navigating rural Japan by train. She finds herself in the café of a leisure centre on the outskirts of Portsmouth, rain lashing against the windows, with the weather having forced last week's grass court event in Southsea into an emergency indoor venue nearby. It is she who caused a sensation by winning Wimbledon's junior event aged 14. I read about her for the first time today – some may be following her fortunes or would have their eyes locked in on a match on Centre Court at Wimbledon this year, something else will be watching you, too; that is what technology – the power of ‘artificial intelligence’ is all about !. IBM Research announced on Tuesday that it is teaming up with IBM IX to bring its new artificial intelligence technology to the tennis courts at Wimbledon this year. After testing the concept at the 2017 Masters golf tournament in April, IBM is taking the AI-powered system to tennis to create "cognitive highlight" reels based on the most exciting moments and shots in the matches each day. Come June and 1st week of July – we will be reading all about Wimbledon, the oldest tennis tournament in the world, and widely considered the most prestigious. It is held at the All England Club in Wimbledon, London since 1877. Tradition is as much a part of the Wimbledon experience as the grass itself, from the predominantly white clothing rule to the strawberries and cream sold around the grounds of the All England Club. One more year and it will be 50 years since professionals were allowed to rejoin amateurs at the major tournaments, a change that removed a level of hypocrisy from the ranks of amateurs, many of whom had long received under-the-table payments. And it allowed all the world’s best players to compete for the most prestigious titles in 1968. Open tennis at Wimbledon began in the summer of 1968. Security protocol is nothing new at the All England Lawn and Tennis Club, but there will be heightened safety measures taken at Wimbledon this year, in light of the recent string of attacks in the United Kingdom. In Wimbledon Park, where there is usually a festival-like atmosphere as camping fans queue overnight, there will be a surrounding wall of waist-high concrete barriers. Metropolitan Police said over the past week there is no specific threat to The Championships, but police presence will be more visible. Armed officers, whom the public saw for the first time inside the Wimbledon gates last year, will be patrolling in and around the grounds. Extensive bag checks, fan searches, bomb-sniffing dogs and plainclothes officers will be further parts of the counterterrorism effort. Not only is it the longest-established of the four Grand Slam tournaments, but the Championships also enjoy sell out crowds and hospitality every year. The two-week long event is broadcast to millions of fans, and made an operating profit of £42m last year. So, things certainly look rosy in the green SW19 garden, with further healthy signs being a 12% increase in the prize money pot this year to £31.6m. But income from broadcasters represents more than half of the event's turnover, and a small number of key broadcast markets, notably the UK and USA, provide the majority of that income. With this in mind, executives from tournament operator the All England Lawn Tennis Club (AELTC), are looking at new ways to grow awareness and interest in the tournament outside their current Anglo-centric heartlands. "Not just in terms of developing physical infrastructure here on the playing site, but also about building our brand with a younger audience, and also with new audiences in different parts of the world, be it China or Colombia. During the tournament a wealth of information is available via different digital outlets. The financial reward from growing its global fan base, will come when Wimbledon signs new TV deals and sponsorship agreements, and is able to show that it can deliver a large and diverse customer base for its partners. 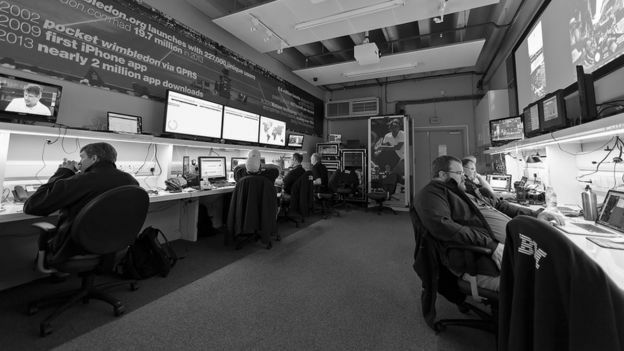 The authorities at Wimbledon wants to provide a rich digital experience that ensures they connect with fans at the event and across the globe. A new real-time tool to highlight matches of particular interest and quality, and not necessarily just those on the main show courts. IBM Slam Tracker - a cross-platform application that provides real time scores, stats and insights for all matches in progress. Apps for those attending have been enhanced by the Ask Fred assistant which allows fans to plan their day and make the most of their visit. On Wimbledon's digital platforms this year there will be computer generated highlights from six main courts - Centre, One, Two Three, 12 and 18. A 360 degree camera view will also be provided from the practice courts. Automated highlights, augmented reality and an all-knowing chatbot called ‘Ask Fred’ are among the new innovations from the the All England Lawn Tennis Club (AELTC) and IBM at this year’s Championships. ‘Ask Fred’ - named after Britain’s legendary three-time Wimbledon champion Fred Perry - is enabled by IBM’s Watson technology and offers a cognitive assistant to answer questions from fans visiting the event. Supporters can get information on a range of topics, including where to eat and drink or the nearest place to buy a Wimbledon towel. Three public wi-fi hotspots - also new for 2017 - will facilitate the process, and Wimbledon and IBM will monitor the questions Fred is asked to provide an improved service for next year. Real-time data will be integrated from a number of sources including courtside statisticians, chair umpires, radar guns, ball position, player location and will also include Twitter for social comment on how the match is playing out. Cognitive computing is the next revolution in sports and they are trying to market a brand to newer consumer group to ensure that funds keep flowing for the sport. Today’s Doodle marks the 140th year of the Wimbledon championships, the world’s oldest tennis tournament. Wimbledon has drawn crowds since the dawn of professional tennis, way back when players were using handmade wooden rackets. The tournament is known for its grass courts, perfectly maintained to a neat 8mm — a sturdy height for fast-moving feet. ~ and for those who remember statistics. Last year, in Men’s final - Andy Murray defeated Milos Raonic, 6–4, 7–6(7–3), 7–6(7–2); in Ladies Singles : Serena Williams def. Angelique Kerber, 7–5, 6–3. In Men’s doubles : Pierre-Hugues Herbert / Nicolas Mahut def. Julien Benneteau / Édouard Roger-Vasselin, 6–4, 7–6(7–1), 6–3; in Ladies - Serena Williams / Venus Williams def. Tímea Babos / Yaroslava Shvedova, 6–3, 6–4; in Mixed doubles : Henri Kontinen / Heather Watson def. Robert Farah / Anna-Lena Grönefeld 7–6(7–5), 6–4. Are you following Wimbledon 2017 and who is your favourite ?